The MARSHALL is a Luxury Hand Crafted Iron Range Cooker, built in our workshop, set on the edge of the beautiful Peak District. Our commitment to manufacturing and engineering is truly reflected in the Quality and Reliability of our Range Cookers. The MARSHALL is not only extremely beneficial in its practicality and affordability, but is classicly styled and finished in a rich, durable vitreous enamel, providing optimal economy with controlled performance. The MARSHALL is unlike most other Range Cookers in its ability to run the central heating and hot water systems without having the oven on; a real benefit in the summer months as your kitchen will remain cool and your fuel bill noticeably lower. Marshall care about the environment, our products exceed the agreed Oftec and Government efficiency standard and are available with condensing boilers. Future not past. 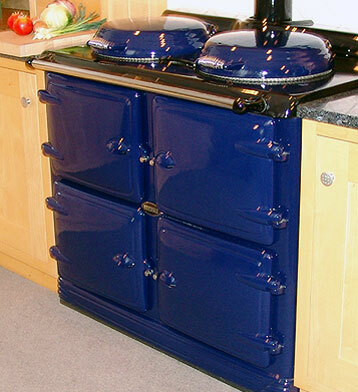 Simply the most beautiful Wood Burning Cooker in the world and you only pay 5% VAT! Available as wood/coal, heats up to 40,000 BTU. For more details on this fabulous oven, contact us.